Bert Semler studies ways to stop viruses from replicating. His goal is to find a medication for people with asthma who suffer greatly from colds. Growing up, Bert Semler ’74 was never a “science nerd.” He read a lot and played sports, but it wasn’t until he came to UC Irvine to earn a bachelor’s degree in biological sciences that he found his calling: studying viruses. Good thing he stuck with it. Now a microbiology & molecular genetics professor at his alma mater, Semler has furthered the science community’s understanding of how viruses behave. The director of UC Irvine’s Center for Virus Research, he’s become a recognized leader in his field, receiving numerous awards and serving as the 2011-12 president of the American Society for Virology, an editor of the Journal of Virology from 2002-12, and a fellow of the American Association for the Advancement of Science. 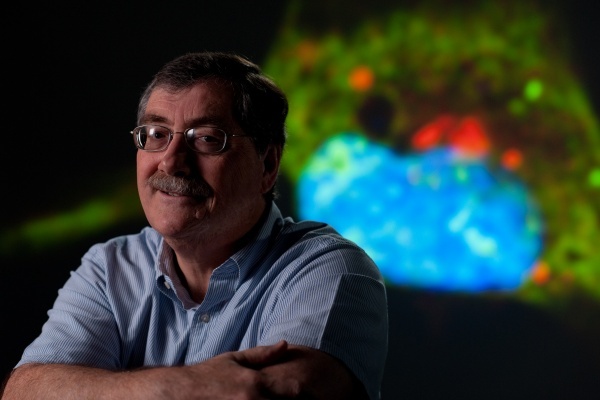 Last August, his lab announced a key discovery regarding a class of RNA viruses responsible for hepatitis, viral meningitis and other diseases. Working with Dutch researchers and UC Irvine colleagues, Semler showed how these so-called picornaviruses reproduce by hijacking a DNA repair activity of human cells. He recently discussed his efforts to understand how viruses replicate – knowledge that could lead to new treatments for everything from paralytic polio to the common cold. What interests you about viruses? Viruses are not just passive entities. They can’t do anything on their own, but in the context of their host, they can take over a lot of functions. They’re able to get their program in place, and that program is to make more of themselves. The problem with trying to stop them from reproducing is that viruses develop a resistance to drugs fairly quickly. When researchers discovered that the human immunodeficiency virus causes AIDS, for instance, they had one drug to treat it, but the virus quickly mutated to fight it. So now they give three drugs for HIV, which makes it harder for the virus to become resistant. Our lab takes a different tack [to stopping viruses]. We’re exploring new frontiers in how infectious agents interact with their host cells to make more of themselves. Once we understand the mechanism of replication, we can study how to interfere with that process and develop treatments. What’s the primary focus of your research? Picornaviruses have ribonucleic acid, or RNA, as their genetic material, rather than deoxyribonucleic acid, or DNA. Because these viruses are genetically simple, they depend a lot on their host cells. One of their unique properties is that they have a protein attached to the end of their genomic RNA. Scientists have known about that since the 1970s. We’ve also known that the protein is cleaved from some RNAs of these viruses during their replication cycles. For years, picornavirus researchers wondered about the identity of the enzyme activity that carried out this cleavage. Our lab decided to reopen that book. Your recent study sheds light on this phenomenon. What did you learn? We discovered the identity of the host cell activity that cleaves the protein from the picornavirus RNAs. This activity is carried out by a cellular enzyme called TDP2, which is part of the DNA repair process in normal, uninfected cells. We were quite surprised it turned out to be this enzyme because picornavirus genomes are composed of RNA, not DNA. The enzyme had never been shown to work on RNA before. What’s the significance of this finding? All picornaviruses have the same linkage of protein to their RNA, and if cleavage of that protein is required for them to replicate, we could find a small molecule or drug to inhibit that activity. That’s what I’m trying to show now — that inhibiting this enzyme activity could stop the virus in its tracks. Will this lead to a cure for the common cold? Perhaps, but I may not see it in my lifetime. For most of us, colds last three to five days. By the time an antiviral medication might get into your system, you’re probably on your way to getting better. But it could happen. The American Asthma Foundation funded our rhinovirus study because people who have asthma suffer greatly when they get a cold. The hope is that we can someday prescribe a medication to help them. With our approach, we’re not targeting the virus itself but one of the functions it needs to reproduce. If we can find drugs or small molecules to stop that process, we may be able to treat all illnesses caused by picornaviruses. That includes the cold. As the threat from emerging viruses such as Ebola and SARS grows worldwide, UC Irvine’s Center for Virus Research finds itself on the forefront of efforts to understand how viruses work. Launched 25 years ago, the center is unique in that it draws upon a range of disciplines to unlock viruses’ secrets, including molecular biology, evolutionary biology, immunology, pathogenesis, biochemistry, structural biology, proteomics, and biomedical engineering. Among the viruses studied at the center are the murine leukemia virus, human immunodeficiency virus, poliovirus, human rhinovirus, coxsackie virus, vaccinia virus, papillomavirus, herpes simplex virus, polyomavirus, and adenovirus, as well as arenaviruses and coronaviruses.